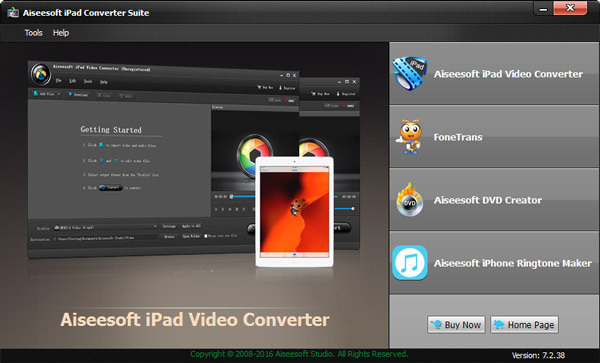 Aiseesoft iPad Converter Suite is the perfect combination of four excellent iPad software: iPad Video Converter, FoneTrans, DVD Creator and iPhone Ringtone Maker. With it, you can convert popular video/audio files to H.264/MPEG-4 AVC, H.264, M4V MPEG-4, MOV, MPEG-4, H.264 HD video and AAC, AIFF, M4A, MP3, WAV audio supported by iPad, and transfer videos, audios and photos between your iPad and computer or between any two iOS device without losing anything. Moreover, it supports the latest iPhone 6/6 Plus/5S/5C, iPad mini 3/2, iPad Air 2, etc. This iPad Converter can convert all popular video formats to iPad, like MPEG 2, HD MTS, MPEG, VOB, etc. It fully supports all Apple devices: iPhone 6s/6s Plus/5S/5C, iPhone 5, iPhone SE, iPad mini Pro, iPad Air 2, iPad Air, iPod touch 5 and iPod nano 7, etc. With the best iOS transfer software in it, you can transfer epub, music, contacts and other files from your computer to iOS devices or from one iOS device to another one. It newly support iOS 9 and iTunes 12.3. The DVD Creator part allows users to make DVD disc/folder/iSO files with any video such as 3GP, AVI, DV, VOB, FLV, M2TS, MTS, SWF, MKV, MPG, MPEG, MPA, DAT, MP4, TS, NSV, MOV, QT, RMVB, etc. Besides, users can create stylish DVD menu. Videos in AVI, MPEG, WMV, MP4, FLV, MKV, H.264/MPEG-4, DivX, XviD, MOV, RM, RMVB, M4V, VOB, ASF, 3GP, 3G2, H.264, QT, MPV, etc. can be converted into iPhone M4R ringtones by this iPhone Ringtone Maker softare. Besides, if you need, you can also get your own iPhone ringtones from audio files in MP3, WMA, AAC, WAV, OGG, M4A, RA, RAM, AC3, MP2 and so on.